J: What is Crypt of the NecroDancer? R: It’s a roguelike rhythm game! 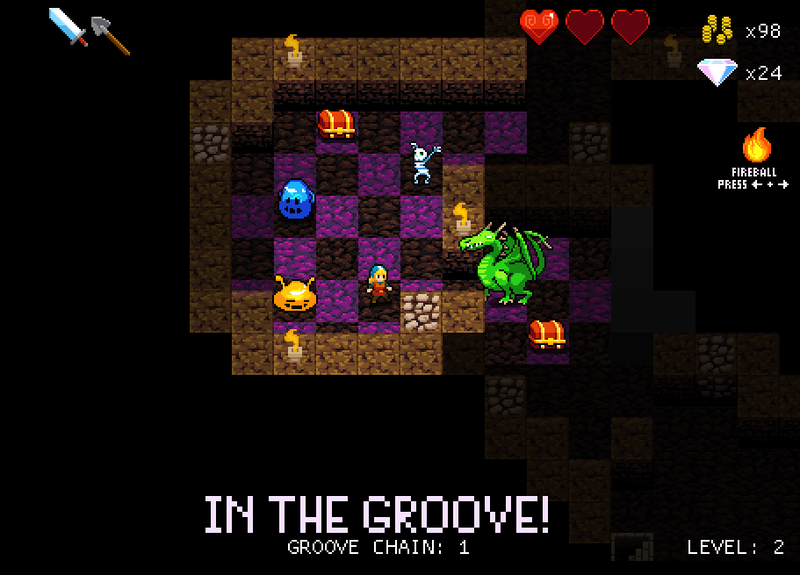 A procedurally generated dungeon crawler, but the player (and enemies) all move to the beat of the music. The game has an excellent sound track (thanks to Alec Holowka and DannyB), but players can also use their own MP3s, if they like! Oh, and the game can be played with a keyboard, gamepad, or DDR dance pad. 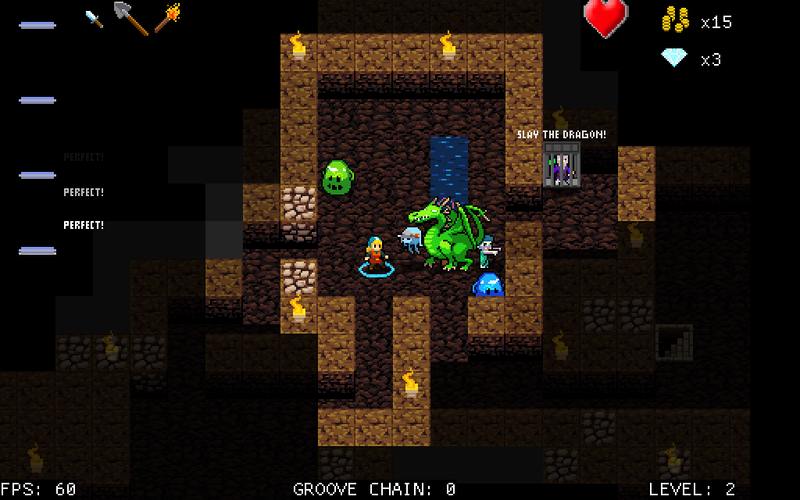 P: How has putting the game to a beat changed the traditional roguelike elements? R: The biggest difference is that you have very little time to ponder your next move. To compensate for this, all of the enemies have very predictable movement patterns. So when you see a skeleton coming at you, or a slime, or a zombie, an experienced player will know exactly where that enemy will move next. So you need to size up the situation while the enemies are a few tiles away, and position yourself so that you’ll hit the enemy instead of the enemy hitting you! J: What are some examples of how have you used rhythm mechanics throughout the game? R: The core is the movement on the beat, of course, but we do have some twists. First, when you kill an enemy you begin a “groove chain”. If you keep moving on the beat (without missing a beat or getting hit) you will continue the chain. As you kill more and more enemies while staying “in the groove” your coin multiplier grows. (This affects the number of coins dropped by enemies.) The game is quite easy to play if you sit and wait for enemies to come at you, but if you want to gather enough coins to buy the more powerful items in the shop, you’ll need to master the art of fighting while staying in the groove. Second, we do have some songs with irregular rhythms. For example, the first boss battle has a “rest” on every 8th beat. If you attempt to move on that missing beat, you’ll be penalized and miss the next beat also, which might be enough time for enemies to strike. But the irregularity is… regular. So after a while, you do adapt and can compensate, though it’s yet one more thing that your brain has to handle while also trying to fend off the boss! Last, we have DDR-like “combos” that are used to trigger spells. For example, to cast a fireball spell you hit the LEFT and RIGHT arrow keys simultaneously. Different key combos will cast different spells. In the future, we may also permit some enemies (or the player) to move on the off beats as well, in certain circumstances. P: We can use our own music to generate the dungeons, if we play the game with our own music what musical elements will affect the game most noticeably? R: Primarily the tempo of the song (beats per minute) and the regularity of it. If the song is erratic, it could be quite difficult for you to stay in the groove. Though if you know the song well, it may not be a problem! If you want the game to be more challenging, you can use songs with high BPM. If the game is too difficult, you could choose songs with low BPM. However, there will be a score multiplier applied to your score for each level — higher BPMs will result in a much higher multiplier. P: How would the game respond if I were to say, try to play a spoken word track? R: It would do its best to find something resembling a “tempo” and you could play to that tempo! There is also the option for players to manually “tap out” their own beats. That way if you don’t like what our beat detection system has done, you can override it. P: I’m a big fan of player abuse. J: Sometimes random dungeons are only as interesting as the code that generates them – how do you strike a balance between procedurally generated and hand crafted dungeon content and keep things fresh? One unique thing about this game is that when you encounter a new enemy, you’ll be scared at first. You won’t know what its movement pattern is, nor will you know how it attacks or how many HP it has! So there will be some very rare creatures that pop up only once in a blue moon — these should keep even the most experienced of players on their toes! J: Will the same song generate the same dungeon each time? R: It depends which mode you’re playing. The standard mode is a normal roguelike quest: Try to get through all of the levels without dying. In this mode, a given song will not generate the same dungeon every time. However, we will hopefully be including a “high score” mode where a given song will always generate a single very difficult level. Players can therefore compete online to see who can get the highest score for a particular song. J: I really want to be the best at Zoot Suit Riot. P: What happens when a song ends? R: A trap door opens up beneath the player and they fall to the next level! Currently they aren’t injured by this, but I think I might make it injure them a little, as punishment for not reaching the exit. J: Do the boss encounters line up with the end of the songs? Something like “In the Hall of the Mountain King” (it gets faster and faster as it goes) would be perfect. We might do a cover of that song. P: How does the player progress at they play through a dungeon – do they level up? Upgrade items? R: There is no leveling, no. It’s all item based. However, there is a metagame involving NPCs that you rescue from minibosses (or discover in other ways). Rescued NPCs show up in the “lobby” and they can provide the player with permanent upgrades such as spells or abilities. J: So there a single player campaign? R: Yes, that’s the core of the game. Complete all of the levels, best all of the bosses, and kill the NecroDancer. You’ll then regain your heart (which he was using to force you to move to the beat). I guess I haven’t told you the backstory of the game! Want to hear it? R: The story goes like this: You see a woman, digging in a graveyard on a dark and stormy night. Suddenly, the ground gives way beneath her and she falls a great distance, to her death! 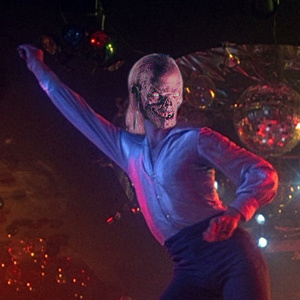 After a brief pause, the NecroDancer appears. He levitates the woman’s body and rips out her heart! With his dark NercoDancer powers, he slowly coaxes her heart to beat again… to the rhythm of his nefarious music! He then disappears as she stands up, realizing that she is now compelled to move to the beat! Boy meets dead girl. Boy rips girl’s heart out. Girl is reanimated for all eternity. P: It’s an excellent twist on some classic tropes, I must say. Is the game twice as fun with a dance mat or three times as fun? J: If Dark Souls taught us anything, dying is super fun! R: Yes, Rogue certainly taught me to enjoy it, when I was a kid! I never did beat it. J: That about wraps it up. Thanks for your time, Ryan. We’re all super keen to get our hands on Crypt of the NecroDancer – when can we expect get it, and what can we play it on? R: We’re slaving away in the hopes of releasing late in 2013. PC and Mac for sure. Console is a possibility. We will explore various mobile options too, but not until after the initial launch. We won’t release on tablets and phones unless the game feels good on those devices. But the fact that everyone has music on their phones would make that a great fit, so we are hopeful that it’ll work out! J: Excellent, looking forward to it. Thanks again. You can find out more about Crypt of the NecroDancer here.